When dielectric liquid-filled electrical equipment is intended to be installed indoors, requirements of Rule 26-012 of the CE Code would have to be met (i.e., this equipment would have to be located in an electrical equipment vault or in a service room, and construction of such a vault or a service room would have to conform with the applicable provisions of the National Building Code of Canada). But what about installation of dielectric liquid-filled equipment outdoors? Does such equipment have to be located in fire-rated rooms and vaults? The answer could be found in Rules 26-014, 26-242 and 26-244 of the CE Code. (c) any ventilation inlet or outlet. (2) The dimension referred to in Subrule (1) shall be the shortest line-of-sight distance from the face of the container containing the liquid to the building or part of the building in question. (3) Notwithstanding the requirements of Subrule (1), the equipment shall be permitted to be installed within 6 m of any item listed in Subrule (1)(a), (b), and (c), provided that a wall or barrier with non-combustible surfaces or material is constructed between the equipment and that item. The safety objective of Rule 26-014 of the CE Code is to prevent burning insulating liquid (which could burn under certain fault conditions) from reaching doors, windows or other openings on a building or from reaching combustible surfaces of a building. 6 m clearance mandated by this Rule is deemed to be sufficient to prevent a potential fire hazard from burning insulating liquid. This Rule allows reducing the required clearance under a very specific condition (i.e., provided that a wall or a barrier with a non-combustible surface is constructed between the piece of equipment and the building). The objective of this Rule is also to prevent access to the live parts of the dielectric liquid-filled equipment to unauthorized persons. Although the safety provisions of the CE Code in general (and of Rule 26-014, in particular) apply only when electrical equipment is being installed in conformance with the CE Code, some jurisdictions are using the safety objective of Rule 26-014 in respect to the clearances from already existing dielectric liquid-filled equipment, when electrical work takes place on newly constructed buildings or on the existing buildings subjected to renovations or additions projects. For example, City of Vancouver Electrical Inspections Branch has published the explanatory Bulletin on application of Rule 26-014 of the CE Code, by clarifying that every newly constructed building or every existing building that is subjected to electrical work associated with additions and alterations has to be evaluated for compliance with the clearances required by Rule 26-014. This Bulletin was issued in light of the fact that the BC Hydro traditionally provided overhead services to its Vancouver customers, and as a result, there have been too many existing high voltage installations of pole-mounted dielectric liquid-filled transformers throughout the City of Vancouver, that are in conflict with clearance requirements of the current CE Code and where a close proximity of such pole-mounted dielectric liquid-filled equipment presents obvious safety hazards. Photo 2. A typical high voltage unit substation. 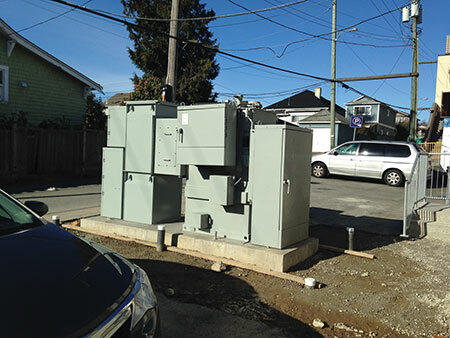 As BC Hydro pole-mounted dielectric liquid-filled transformers already exist on streets and alleys, this clarification Bulletin was intended to advise electrical designers and electrical installers that evaluation must be carried out to ensure that a potential explosion of the existing BC Hydro transformers will not adversely affect newly constructed or renovated buildings. Provision of item 26-014(4)(a) of the CE Code “be inaccessible to unauthorized persons” has been also extended by this Bulletin to high voltage overhead conductors used in conjunction with pole-mounted dielectric liquid-filled transformers, as Table 33 of the CE Code mandates minimum 3 m horizontal clearance of the high voltage conductors from the adjacent buildings and structures. Some jurisdictions publish specific directives or bulletins to also clarify conditions for application of item 26-014(4)(b) which mandates that the dielectric liquid-filled equipment installed outdoors must “not obstruct firefighting operations”. Therefore, in addition to the generic provisions of Rule 26-014, existence of all applicable regulatory bulletins or directives should be checked in conjunction with application of Rule 26-014 of the CE Code. Let’s now review particular requirements of the CE Code for outdoor installation of dielectric liquid-filled transformers. (d) have conspicuously posted, suitable warning signs indicating the highest voltage employed except where there is no exposed live part. It could be seen from this Rule that it mandates compliance of installation of dielectric liquid-filled transformers with generic requirements of Rule 26-014, and that it also specifically states that each such dielectric liquid-filled transformer must be surrounded “by a suitable fence in accordance with Rules 26-300 to 26-324“ – if the transformer is “not isolated by elevation or not housed in suitable enclosures.” The wording “not housed in suitable enclosures” as a condition for a fence around such transformer is selected not by accident. It should be noted that a typical pad-mounted dielectric liquid-filled transformer is not made “approved” by means of certification to the CSA certification standard (CSA Part II standard), as there are no such Part II certification standards. Therefore, the wording of the installation Code could not be coordinated with the requirement of the certification standard by stating that the enclosure intended to prevent unauthorized access to the live parts of the equipment must be specifically marked in accordance with the standard, to indicate such fact to the users of the transformer. such “approval” by means of field evaluation/special inspection would have to be subjected to the acceptance by the AHJ which inspects the installation”. Thus, if the SI body which performs a field evaluation of such transformer could state that the transformer is housed in a “suitable enclosure” for the purpose of prevention of unauthorized access, then construction of a fence around such dielectric liquid-filled transformer would not be warranted in accordance with paragraph 26-242(10(c) of the CE Code. It should be also noted that in majority of cases, a complete integrated assembly comprising a HV load break, metering equipment, dielectric liquid-filled transformer and a LV switchboard is brought for installation on a concrete pad (see attached photos). Such integrated assembly is called “unit substation” and this unit substation would have to be made “approved” before the AHJ could allow it to be installed under provisions of the CE Code. This “approval” would have to be also performed by means of a special inspection to the CSA Model Code SPE 1000, as there are no other means available to make such integrated assemblies “approved”. A proposal has been recently submitted to the CSA to amend Rule 26-242 so as to reflect this practical issue. (1) Except as permitted by Subrule (2), dielectric liquid-filled transformers installed on the roof of a building shall be located in an electrical equipment vault in accordance with Rules 26-350 to 26-356, and adequately supported by means of non-combustible construction. (2) Transformers containing a non-propagating liquid, suitable for the purpose and having a flash point not less than 275 °C, that are installed on the roof of a building need not be located in an electrical equipment vault but shall not be placed adjacent to doors or windows, nor within 4.5 m of discharge vents for flammable fumes or combustible or electrically conductive dusts”. It could be seen from this Rule that the dielectric liquid-filled transformers intended to be located on the roof of a building, must be installed in an electrical equipment vault, unless conditions specified in Subrule (2) be met. However, as usual, in each specific installation case, the AHJ with jurisdictional authority for administration of the CE Code should be consulted.